Terri Good was understandably skeptical about her first encounter with a 3G Cardio Accelerated Vibration Training machine. 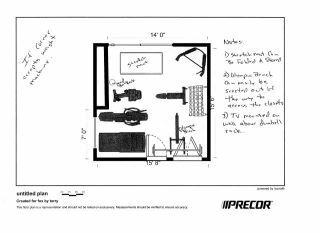 When Push Pedal Pull director of sales, Doug Corson, tells customers and even his sales associates about the many benefits of Accelerated Vibration Training (AVT), it comes from his heart and legs, chest, shoulders and arms. We're all looking for a little extra motivation to keep our New Year's Resolution this time of year. 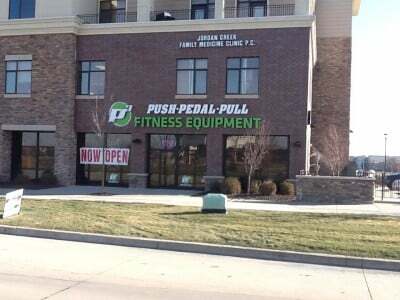 Simply share your best "fitness tip" or the secret behind your biggest fitness accomplishment and earn a chance to win a $150 gift card from Push Pedal Pull! A panel of judges from P3 will select the top 3 winners... 1st prize: $150 Gift Card. 2nd prize: $100 Gift Card. 3rd prize: $50 Gift Card. We'll accept entries from today through Jan. 31st, so inspire others and WIN! Happy New Year from Push Pedal Pull! The CrossFit wave is sweeping gyms across the nation. CrossFit is a type of strength and conditioning program that basically prepares your body for anything. 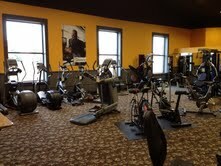 It’s functional training to the extreme. Described by its founders as “minimalistic,” CrossFit gyms are often sparse and contain simple equipment. CrossFit is usually done in a group and encourages both competition and teamwork. 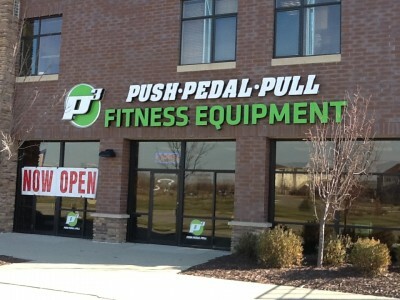 Black Friday marked the official opening of the newest Push Pedal Pull store in West Des Moines, Iowa. The store is conveniently located in the Jordon Creek Plaza, just east of the Jordon Creek Mall. We are celebrating the grand opening of our two new stores... Maple Grove, MN and Burnsville, MN... and we want you to share in the fun. 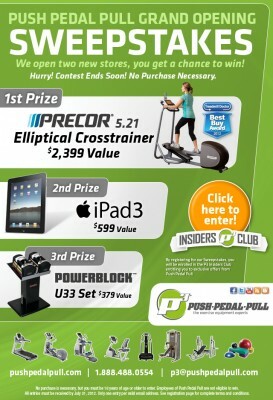 Enter to win a variety of prizes in our Grand Opening Sweepstakes! No one likes buyer’s remorse. You know that feeling... the horrible sinking sensation in your gut because of a bad purchase. With some ill-fated shopping selections, you can shrug your regret off and move on. However, there’s one type of purchase faux pas that is worse than all of the rest. The buyer’s remorse that grows with time. 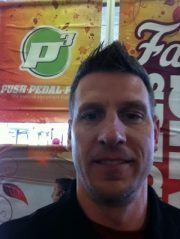 Meet Brandon Lohr, Assistant Manager at the Push Pedal Pull in Tulsa, Oklahoma. This fitness expert has worked at Push Pedal Pull for 10 years. Brandon played football at the University of Tulsa, where he graduated with a degree in Exercise and Sports Science. For Brandon, the highlight of his job is matching a customer to the perfect machine to help them reach their goals. He had an exciting opportunity recently where he got to do just that, but on a larger scale.